The first startling thing about these two novels, pioneering lesbian Bildungsromans, first published in the same year, under pseudonyms, by two writers who would go on to have a two-year affair seven years later, is how even more similar they are than this would suggest. 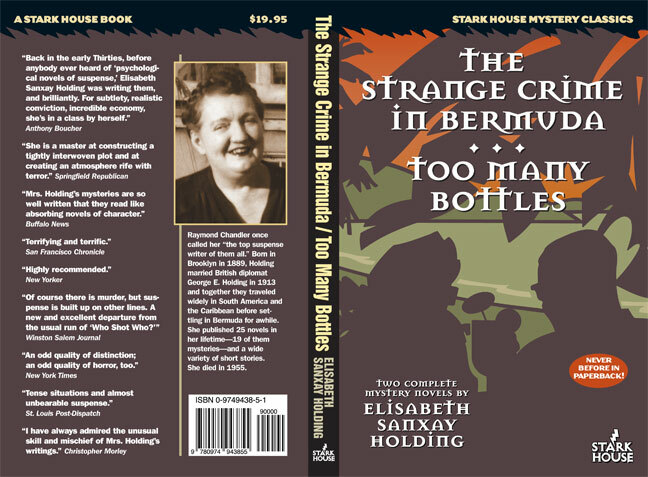 For more of this vintage review, please see here...and for fresher and rather less sloppily-written reviews, try Patti Abbott's page. Terribly sorry, folks, but the family crises are not quite done (they won't be entirely "done" for some time) and the work and other delays that they have forced have to take first precedence at the moment (or first through third, you know how it goes...). I might be able to play catch up later this week, because seeing and reading your entries is always a great boost for me, and whatever I do to draw some readers your way always cheers me as well. Thanks, and further apologies for the delays. * 98 • A Canticle for Leibowitz • [Saint Leibowitz] • (1955) • novelette by Walter M. Miller, Jr.
* 126 • The Women Men Don't See • (1973) • novelette by James Tiptree, Jr.
H as in homicide, by Lawrence Treat. Justice, inc., by Rog Phillips. The adventure of the double-bogey man, by Robert L. Fish. 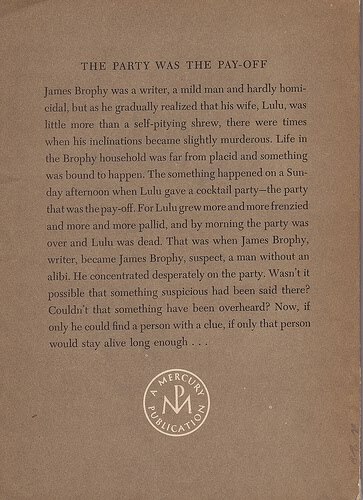 File 1: the Mayfield case, by Joe Gores. A humanist, by Romain Gary. A case for the U.N., by Miriam Allen deFord. A soliloquy in tongues, by William Wiser. I will please come to order, by William North Jayme. His brother's keeper, by James McKimmey. The opposite number, by Jacob Hay. 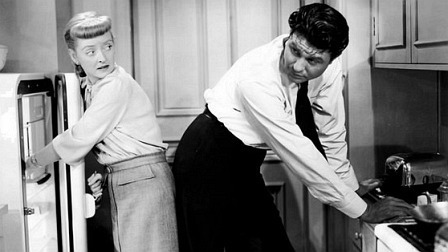 The right man for the right job, by J. C. Thompson. The adventure of Abraham Lincoln's clue, by Ellery Queen. The chosen one, by Rhys Davies. The adventure of the red leech, by August Derleth. The two kings and the two labyrinths, by Jorge Luis Borges. Papa Tral's harvest, by Barry Perowne. Good man, bad man, by Jerome Weidman. The Stollmeyer sonnets, by James Powell. The Dr. Sherrock commission, by Frank McAuliffe. The oblong room, by Edward D. Hoch. The peppermint-striped goodby, by Ron Goulart. The gracious, pleasant life of Mrs. Afton, by Patricia Highsmith. By child undone, by Jack Ritchie. The possibility of evil, by Shirley Jackson. Two anthologies that are both at least in part retrospective tributes to Anthony Boucher, cofounder of F&SF, and later editor of six volumes in the long-running crime-fiction annual, up till the time of his death...Allen Hubin took over at that point. 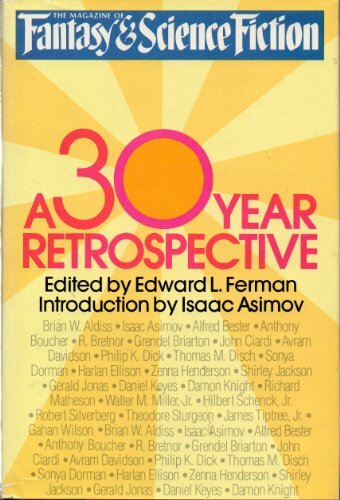 Edward Ferman, by 1979 both editor and publisher of F&SF for some years, polled his lifetime subscribers for input as to which of the stories from F&SF's past deserved most to be reprinted in the first all-reprint fiction and poetry issue of the magazine, and the subsequent book version...and while the voters couldn't settle on a single work by Fritz Leiber, Robert Bloch, Joanna Russ nor Manly Wade Wellman (thereby all but invalidating the process), they were able to provide the above list of favored work from the magazine's rich history...and Ferman only overruled them once, as far as I know, by substituting the very personal story "Selectra Six-Ten" for "The Golem," one of the most famous but perhaps somewhat less distinctive of the stories of Avram Davidson, the previous F&SF editor and with whom Ferman had worked as assistant editor. 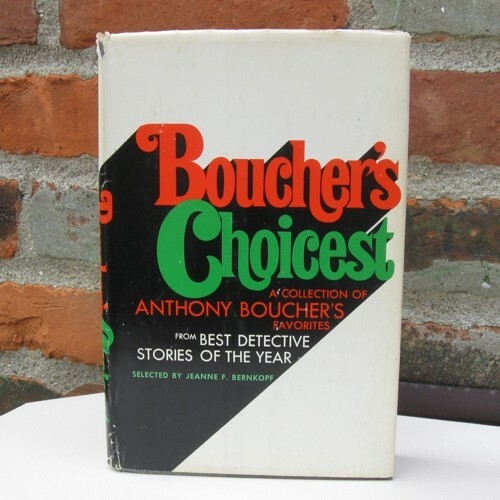 Boucher had been founding co-editor from 1949 (and earlier) to 1954, and continued to edit the magazine alone for several more years before turning it over to Robert P. Mills, aided by C.M. Kornbluth, for several more (though Kornbluth's premature death kept his tenure short). Truly a brilliant assemblage, even with the missing-writer caveats. 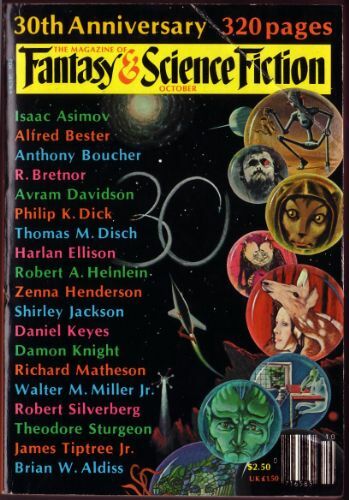 Richard Matheson's first story, and the first by Damon Knight to get much attention, are both eminently memorable, but slight in the company they keep here (or when compared to some of their other stories to appear later). 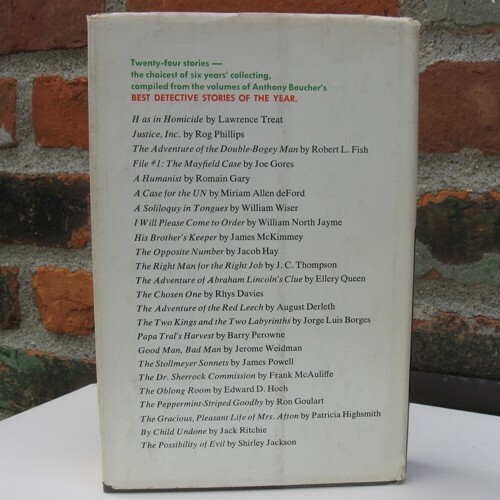 Daniel Keyes's "Flowers for Algernon" is almost impossible not to include (even if one wanted to exclude it), and Boucher's own "The Quest for Saint Aquin" is the only story originally published elsewhere. Meanwhile, Algis Budrys reviews Robert Onopa's The Pleasure Tube , which I keep meaning to dig back out for FFB, but I definitely need to reread it...both men would have a major effect on my writing, Onopa as my first writing professor. Meanwhile, Dutton editor Jeanne F. Bernkopf looks back through the BOTY volumes Boucher edited for her list, and recalls the stories he either did or at least seemed to enjoy most, and reprints Boucher's headnotes in their reprinting here...not only an excellent compilation and probably a pretty fair representation of what the already late Boucher would've culled for his own Best of the BESTs, but also notable for how many of these writers were still doing notable work a decade later, when I was catching their new stories in the magazines and elsewhere. 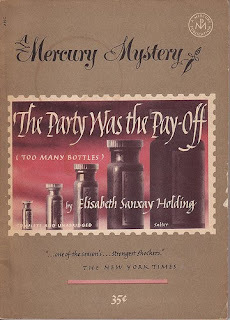 Allen Hubin, who would inherit the editorial post for a handful of years, turning the series over to Edward Hoch for the longest reign the annual would see (through title-change and a new publisher), puts Boucher in context in his brief introduction, and the stories, heavily running to Ellery Queen's Mystery Magazine and Alfred Hitchcock's Mystery Magazine stories with a few other sources (Hoch's own brilliant "The Oblong Room" comes from The Saint Magazine), speak very entertainingly for themselves. own considered acceptances (and those of his partner and heirs, in the first book/issue). If you don't have these volumes...I suspect you can see you might need them, and you will suffer no pain in reading them. 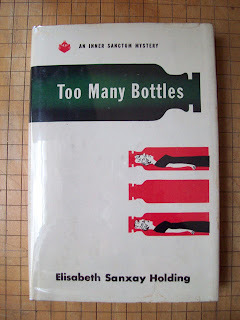 A short, and relatively late, novel by Elisabeth Sanxay Holding, and one which plays to her strengths without showcasing any of them in their best light, except perhaps her casual wit and the smoothly readable pacing she brought to most of her work I've read (a fraction of her work in the crime-fiction field). 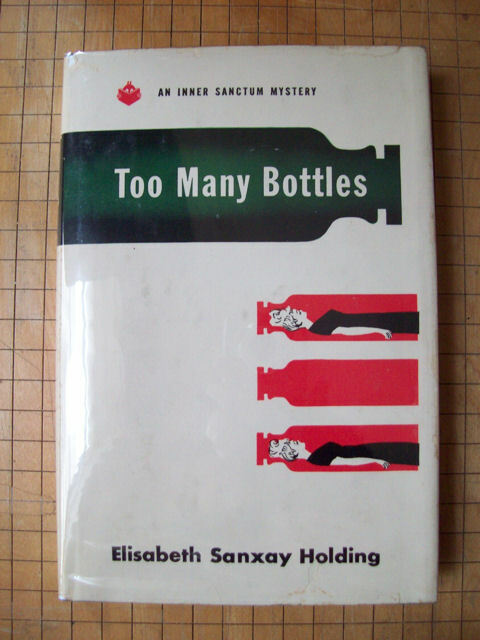 A 1951 "Inner Sanctum" mystery, it mixes elements of the psychological suspense story she and Cornell Woolrich and Robert Bloch and Daphne Du Maurier and others were developing in the 1940s with some of the conventions of the drawing room mystery and even a touch of the police procedural, while mostly being from the perspective of a freelance writer, James Brophy, who has let his life get beyond his control. At least, he's been drifting along enough so that his social-butterfly wife and her sister, an increasingly shrill and dependent presence in the household, go through gyrations that lead to several murders...while he attempts to get some work done on one or another short story or serialized novel or novella (particularly one in progress called "The Party Was the Payoff"), with hopes of placing This one in a slick magazine rather than a pulp. 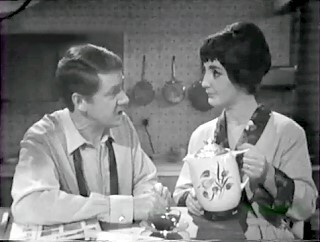 Another woman catches his resigned eye, and she plays a significant role as well, at one point trying to fix him up with a job with an early 1950s version of Open University, an offer he dodges with a shudder and several quietly offputting suggestions to the Ms. Vanderbilt (but not of Those Vanderbilts) who runs the multi-disciplinary arts "school" for adults. 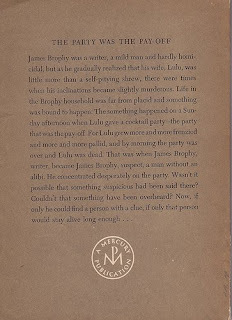 The Mercury Mystery edition (a Dannay title change? 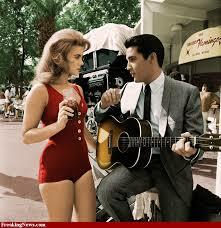 Or ESH's title restored? 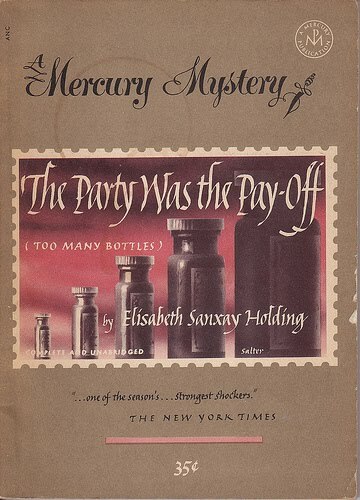 ), Mercury Press 1952, and as a Mercury Mystery, in undated digest-sized magazine format (at the end of its run, after Mercury Press sold EQMM to the new Davis Publications, Mercury would become a full-fledged fiction magazine, with each issue featuring a novel and short essays and fiction). I will try to gather the usual suspects (which is to say, valued contributors and valiant fellow-travelers) to this weekly gathering of links to reviews of underappreciated or at least not terribly widely-seen work...but it might well be delayed (in final form) today, as my parents are facing a dual set of crises which, like most in this country devoted to making everyone pay for human frailty with their everything in their material lives (at least), might bankrupt them and us, meaning my brother and myself. Alzheimer's isn't a disease that Medicare will pay to address or treat with, for example...and why should it? How trifling few Americans suffer from such an exotic and rarely-seen thing...and certainly no one can gainsay the current attempt to hand the insurance companies in the US even more money than they already extort, rather than admitting that a nation that beggars its families. at least those who seek better than warehouses for aging relatives to rot in, is a nation not working correctly, and a president who, rather than actually seeking to set up a reasonable healthcare system that migh rival those of such countries as Canada or Germany, one which is basically not propped up by too many more tax dollars (or euros) per capita than our own, is damned ignorantly by most of his adversaries for seeking to install (ever more eventually) Romneycare "socialism" rather than for being the kind of corporate tool that he and his administration are in nearly every way...well, you can see I'm a bit distracted this week. Checking facilities is a fair amount of work. Paying for them will be vastly, vastly moreso. 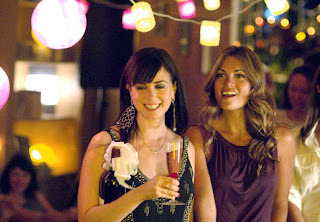 ...more to follow, as time permits. Thank you all, and all the other folks who've helped make this weekly exercise so much fun, as writers and readers/commenters. A revisit with this brief survey, now that we've lost one of the last surviving Futurians, Frederik Pohl. Frederik Pohl is credited with getting it all going, sort of. 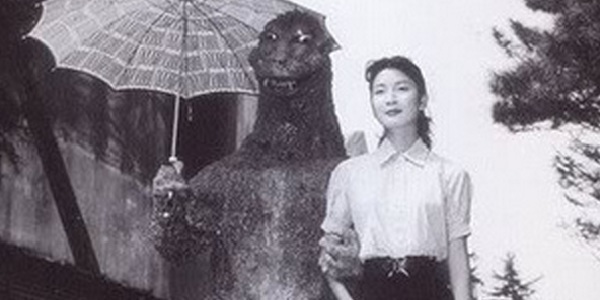 He was the young editor of Astonishing Stories and Super-Science Stories, nineteen when he started in 1939. 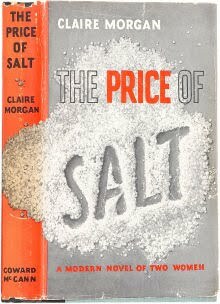 His magazines were published by the discount line, "Fictioneers," of the Popular Publications pulp house...so he was getting less per week than the lowest-paid secretaries at Popular, and was expected to write for his own magazines. 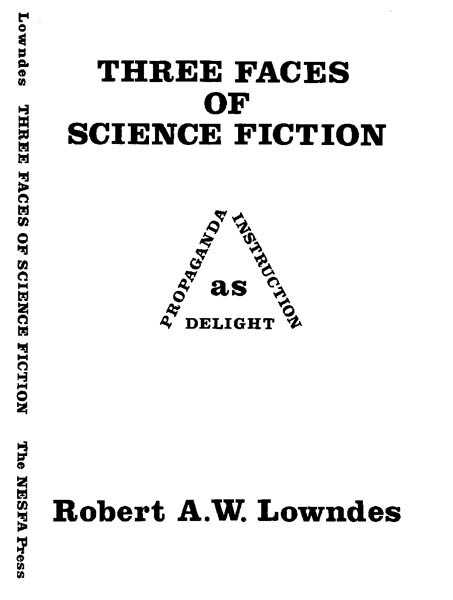 One way he did so was in writing book reviews...and, unusually for the pulps, he took his best shot at applying technical literary criticism to the books under discussion. Slightly younger member of the NYC-based sf-fannish group the Futurians (which included Pohl) Damon Knight took that as his model, for his reviews in fanzines and then for reviews in professional sf magazines, and so did James Blish, who chose to write his criticism under the pseudonym William Atheling, Jr. (after Ezra Pound's use of "William Atheling" for his own critical work...in its turn a reference to an historical figure among English royalty). 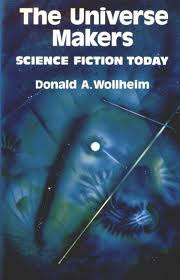 Donald Wollheim, one of the few members of the Futurians (slightly) older than Pohl (and the primary rival of Pohl's in the factionalism that developed in the Futurian Society) had published before Pohl, but became an editor afterward, and for an even less-well-bankrolled publisher...and his critical writing was somewhat less prominently published, as he focused on his editorial and publishing career. 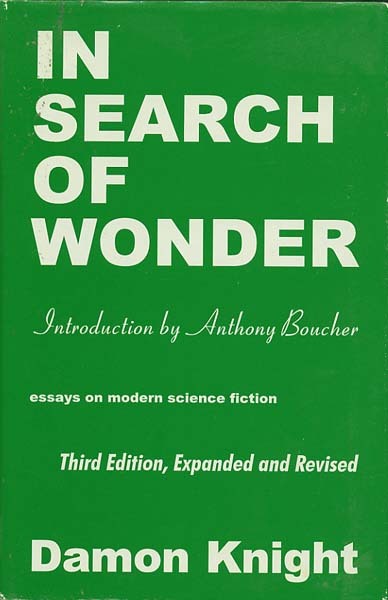 For that matter, Pohl never published a volume of critical writing, while Wollheim restricted himself to the survey The Universe Makers, a chatty review of broad themes published in 1971. 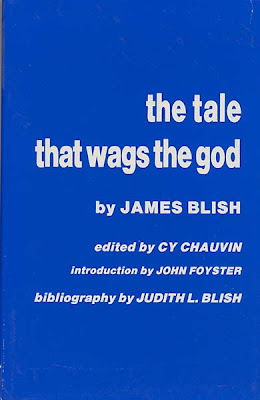 Pohl has contributed to various anthologies of critical writing over the years, such as those edited by R. Bretnor, and had a column, "Pohlemic," devoted to criticism of literature among many other things as they occurred to him in the magazine Algol, later Starship, in the 1970s. 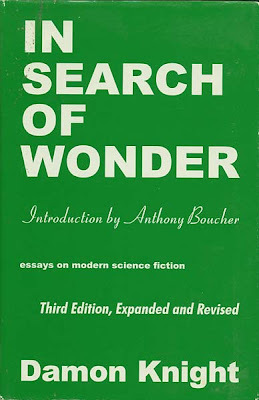 But Knight and Blish published books of their critical writing early on, Knight winning the first Hugo Award for nonfiction with the 1956 first edition of his In Search of Wonder, and Blish as Atheling, Jr. following up in 1964 with the first of what would eventually be three volumes of his collected critical writings, The Issue at Hand, both these volumes published by the small house devoted to sf criticism and historical writing, Advent: Publishers. Advent is for the most part sustained these days by the NESFA Press, the New England SF Society imprint that grew out of the MIT-based fan group responsible for a wide range of Boston-area fannish activity, including the Boskone conventions, and the books in tribute to Boskone guests. 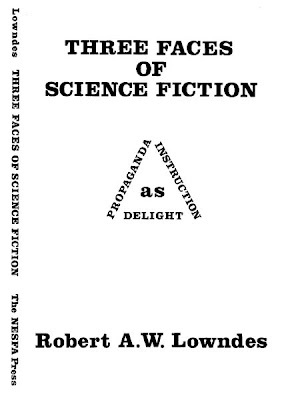 Thus a relatively early NESFA Press publication, collecting the historical and critical essays of the third magazine editor to come out of the Futurians, Robert A. W. Lowndes, who published the contents of his The Three Faces of Science Fiction as editorials in his 1960s magazine Famous Science Fiction; despite some impressive reprints and new fiction in that Very low-budget magazine, Lowndes's essays were often the highlights of a given issue. So...amidst a slow trickle, at first, of critical and historical works about sf beginning to appear in boards, beginning with Lloyd Arthur Eshbach's anthology of essays Of Worlds Beyond and J. O. Bailey's augmented PhD thesis Pilgrims in Time and Space in 1947, about half up through the early '70s had come from the ex-Futurians noted here...and these were among the most important books of my early reading...along with autobiographical and biographical works that these folks, and such fellow ex-Futurians as Judith Merril and Dave Kyle, would write and have published (most in the 1970s), along with those who were influenced heavily by the work of these folks (including Joanna Russ, to some extent Ursula K. Le Guin, Barry Malzberg, Robert Silverberg, Brian Aldiss and particularly Algis Budrys, all of whom produced their own collections of critical writings that have been covered by others and/or myself in this series of FFB posts). 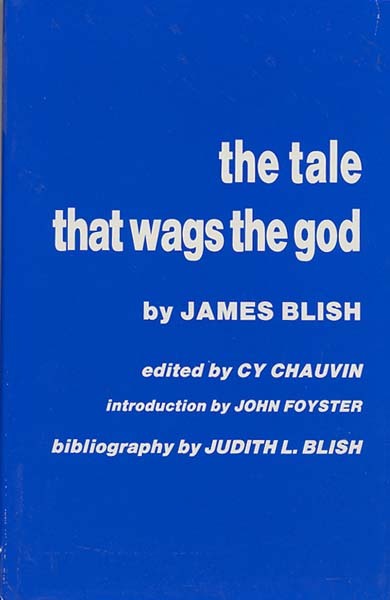 As Budrys would note in the 1970s, Blish brought a better literary (and, as a student of music and Shaw's criticism, critical) education to the task, but Knight was even better at stating clearly and forcefully his technical and other sorts of assessment of a given work. All, however, are valuable, particularly when compared to such lesser work in the same vein as that offered by Sam Lundwall and Alexei Panshin, among many others who followed the pioneers...or Sam Moskowitz, who attempted to do important work contemporaneously with these folks, and sometimes did so well, but usually didn't. 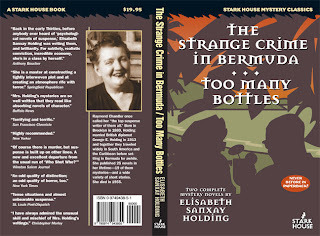 For more, and probably more amusing and fully-realized, examples of today's choices of books, please see Patti Abbott's blog. "The Tunnel Under the World"